This is an excerpt from ‘Venturing and the Future of Mobility and Automotive Technology’, a new report from Global Corporate Venturing and LEIF, which is sponsored by Denso International America, Castrol innoVentures and Magna International. The report will be released late in November ahead of a conference of the same title in London on December 1st, where Jonathan Tudor of Castrol innoVentures and Ian Simmons of Magna are among the speakers. If you're a new mobility and auto-tech businesses that would like to present at the conference and /or appear in the report, please contact please contact tom.whitehouse@london-eif.com. With $32bn in revenues last year, Magna International, global automotive supplier, is probably the largest company you’ve never heard of. Its OEM clients range from Aston Martin to Ford and just about everyone in between. Its product range is equally diverse, from electronics to chassis, drive trains and seating. The chances are that many, if not most, of the parts of the car you drive were made by Magna. It manufactures from over 312 sites globally, employing 155,000 people. Ian Simmons, a Brit who began his automotive career as a mechanical engineer with Ford in the UK nearly forty years ago, is charged with running Magna’s “all-tech” venturing strategy which is designed to keep it in the vanguard of automotive design and manufacturing. He drives a Ford Edge and a BMW 335i, and for fun, a 1980 MGB and 1973 Triumph TR6. Tom Whitehouse: Ian, please explain Magna’s venturing strategy? Ian Simmons: It's simple. We're looking at early stage technologies that could compliment or enhance Magna’s current product portfolio. So we're a strategic partner not a financial investor. And bearing in mind that we have a very wide product range, our appetite for new technology is very broad. In addition, we look outside of the automotive industry as well because innovations we may need are just as likely to be found in medical, aerospace and software. I want the venturing and innovation world to understand that Magna is an active player in the transformation of the vehicle and the automotive landscape in general. We are very much open for business. IS: Many of the 'light-weighting' composite technology and materials used by the automotive industry today initially came from aerospace. The biometric security technologies that we are increasingly exploring initially came from the medical industry. And as connectivity increases in transportation, the technology required for cyber-security and the effective use of big data is coming from the software industry. We are now an all-tech industry and Magna has an all-tech venturing strategy. TW: That’s an ambitious and demanding strategy. How do you source investments? IS: We manufacture all over the world so we have a global footprint which we have used to cultivate relationships with the best universities, venture funds, start up community and accelerators, and even with individual innovators. We've invested alongside other VCs and accelerators to increase deal flow. For example, we recently backed companies in Israel, Canada and US. We also seek innovation internally, not just through traditional R&D, but by challenging our employees to generate new business and technology ideas. And we co-invest too of course. We are increasingly our venturing efforts and you’ll hear more about them in due course. TW: Let’s focus on disruption in the automotive sector. I’m talking about car sharing, electrification, connectivity, autonomous vehicles, and the demand for ‘mobility as a service’ etc. It’s going to be a hell of a shake-up. As a tier one supplier to the OEMs, do you feel less vulnerable to this disruption than the OEMs themselves? IS: Not really. We’re happy that our markets are growing and we have more customers. We certainly expect more vehicles to hit the road, particularly in Asia, in the short and medium term even as new industry players enter the market and traditional automakers adopt new business models and evolve. But (and it’s a big ‘but’) the very same disruptive forces impacting the OEMs also affect us, particularly in the heart of our business – in how we design and manufacture. TW: Please give some examples of the impact at the design and manufacturing level. IS: The connected and autonomous vehicle is going to need much greater computing power and generate a lot more data. So a vehicle's electrical architecture may have to be completely changed. And if vehicles are getting more usage because they have multiple owners, that's going to force some radical changes too. Today, cars in many urban and semi-urban environments might be used for ten hours per week. If they’re going to be consistently used over ten hours per day, then they’re going to have to be designed differently and made differently. And we’re going to be making a wider range of cars - electric, hybrid, SUVs, SAVs, cross-overs. Our product is going to become more and more complex, with more features and functions. So we’re going to have to manufacture with greater flexibility, efficiency and advanced processes. TW: So as a corporate VC, you're as interested in innovations in the factory as you in the innovations that are on the road. IS: Of course. Just like the car, manufacturing is now a part of the Internet of things, with all the same challenges and opportunities around analytics, security, computing power, robotics and machine learning. As a result of our global footprint (312 facilities), we can serve as a source of information and implement some of these technologies. New models of transport and mobility are bringing changes to Magna’s definition of the smart factory which could enable new models of mobility. It’s a symbiotic relationship. TW: Let’s talk about some of the direct venture investments you’ve made. IS: There will be 50 billion items connected to the Internet by 2020 and this creates big security challenges. A lot of personal information will be going through your car. We invested in Argus Cyber Security because car users will expect their vehicles to be protected from cyberattack just like their other smart devices. We believe that Argus is the world leader in this field. We also invested in Zubie because it’s a pioneer in adding connectivity to the whole automotive supply chain, which is going to impact us very directly. Another investment is with Peloton, a company leading the way in introducing autonomy to transportation, starting with trucks and haulage. We don’t manufacture extensively for trucks, but by investing in Peloton we can learn how autonomy is likely to be adopted in mobility overall. The venture firms we’ve backed extend our pipeline of potential investments and provide a window on innovation across several industries. TW: At the moment, Magna is seen as ‘the largest companies in the world that no one has heard of’. Do you think this will change? Will you ever become a consumer-facing brand? IS: No, we will not have a Magna branded car. My job is to make sure that the best technologists and innovators know Magna, our value proposition and know of our readiness to partner and invest. We have an unrivalled track record in technology commercialisation so we can be a very good corporate venture and technical partner for early stage businesses. Magna International will be ready for whichever way the automotive industry evolves. TW: What do you drive? IS: A Ford Edge and a BMW 335i, and for fun, a 1980 MGB and 1973 Triumph TR6. This is an excerpt from ‘Venturing and the Future of Mobility and Automotive Technology’, a new report from Global Corporate Venturing and LEIF, which is sponsored by Denso International America, Castrol innoVentures and Magna. The report will be released late in November ahead of a conference of the same title in London on December 1st, where Jonathan Tudor of Castrol innoVentures and Ian Simmons of Magna are among the speakers. If you're a new mobility and auto-tech businesses that would like to present at the conference and /or appear in the report, please contact please contact tom.whitehouse@london-eif.com. Jonathan Tudor, director at BP Castrol innoVentures, sets out his venturing strategy below. Connectivity, autonomy, efficiency and mobility as a service are key themes. Just in case you’re wondering, he drives an S Jaguar and a BMW i3. Tom Whitehouse: Jonathan, please explain your venturing strategy. Jonathan Tudor: The role of Castrol innoVentures is to create new value and new revenue streams for Castrol, which is a part of BP. Our investment strategy is driven by emerging opportunities and trends that we regard as important and that we need to understand better. If a strategic opportunity emerges as a result of our investment, we could pursue it and develop it into a new business strand. If not, we will act just as a financial investor. But we’re not a typical corporate VC because we’re involved in more than investment. We also do internal venturing. TW: Ok, let’s start with your investments. Please provide some examples of companies you’ve invested in and say why. JT: We know that one very important development in the transportation sector is connectivity. More and more passenger and industrial vehicles are going to be connected to the internet. We need to learn about the market dynamics, what will drive early adoption and what our role should be. So we invested in Zubie, a US-based telemetry company that provides data for insurance companies, fleet performance for business users and consumers. Connectivity and telemetry are going to have a huge impact on transportation. There’s going to be a much more dynamic relationship with insurance and entertainment industries, for example. TW: Other than connectivity, what other themes are driving your investment strategy? JT: Big data, AI and machine learning are big factors in increasing transport efficiency and in the emergence of autonomous and semi-autonomous vehicles. We invested in a Danish business called Greensteam, which helps its shipping customers save fuel by understanding their data and making real-time recommendations on how to improve efficiency, and on things like how quickly their propellers are fouling up. We invested in Peloton, a California-based semi-autonomous vehicle technology business. [See separate blog on Peloton below]. It enables heavy vehicles to link together in a tightly-knit peloton (hence the name) to reduce fuel costs and increase safety. Through Peloton, we’re finding that trucks are moving more quickly to autonomy than passenger vehicles. It’s helping us understand what our role could be in this area. TW: What’s the connection between your investment strategy and the Castrol brand? JT: Castrol has a long history of consumer trust and awareness. We’re keen to see that continue in a digital environment. So our first investment was in 2012 in a company called RepairPal, a Californian business which certifies car repair shops to provide transparency to the customer and to increase the level of service. RepairPal was a way for Castrol to understand the impact of digital innovation on our industry. The company tackles head on the question of how you digitise your relationship with your vehicle and how you create trust between the vehicle owner and the repair shop or garage that services the vehicle. And through our investment in RepairPal, we learned that you had to digitise the whole workshop. This then led to our investment in Autino which is set on a further digital transformation of transport. It’s providing the type of simplicity and convenience to vehicle owners across a range of services that they are used to getting in pizza delivery. TW: Let’s talk about internal venturing. JT: Ok. These is when we look at our customer base, inside and outside transport, identify its needs, and try to provide them, typically in joint ventures. We have tens of thousands of customers in manufacturing, in metal-cutting for example, who can optimise their efficiency and reduce costs through better management of data and through machine learning. This is what Castrol Optis does. It’s a joint venture with TechSolve, a US-based specialist in process improvement. Nexcel is another good example of internal venturing. Nexcel packages the oil and filter into a single, easily removable container, just like a print cartridge. This was launched with Aston Martin and brings lots of improvements in engine design and efficiency. TW: What innovations are you looking for right now? What types of investments? What are the trends that you want to understand? JT: Mobility is going to be a big theme for us. We see new generations happy to access rather own vehicles. They want mobility as a service. This is already creating businesses with great prospects such as Uber and Lyft. We’ll soon be announcing our first investment in this space. I doubt it will be the last. Then the other areas of great interest to us are simply the better utilisation of energy in transport, whether that’s in an electric vehicle or in an internal combustion engine. We’re also looking closely at machine learning, AI and data, particularly in a manufacturing context, which could become channels for Castrol Optis. And we will continue our interest in advanced materials and chemicals that can make our products cleaner and greener. JT: I drive a portfolio S Jaguar and a more environmentally friendly BMW i3 electric vehicle. This is an excerpt from ‘Venturing and the Future of Mobility and Automotive Technology’, a new report from Global Corporate Venturing and LEIF, which is sponsored by Denso International America, Castrol innoVentures and Magna, all of which are shareholders in Peloton. The report will be released in November ahead of a conference of the same title in London on December 1st, where Magna and Castrol innoVentures will among the speakers. For more information on the report and/or the conference(s), please contact tom.whitehouse@london-eif.com. We're particularly keen to hear from new mobility and auto-tech businesses that would like to present at the conference and appear in the report. Peloton Technology is a California-based semi-autonomous vehicle technology business. It enables heavy vehicles to link together in a tightly-knit peloton (hence the name) to reduce fuel costs and increase safety. It does through radar-based braking systems and vehicle-to-vehicle communications. 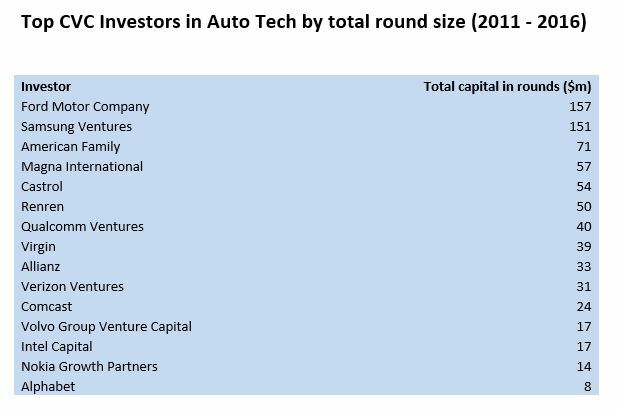 Peloton’s roster of shareholders is a who’s who of corporate VC leaders in the automotive sector. All are active. Denso International America and Intel Capital lead the $17m April 2015 a round and were joined by Nokia Growth Partners, Lockheed Martin, Magna International, Castrol innoVentures, Volvo Group Venture Capital and UPS Strategic Enterprise Fund. Angel and financial VCs also invested. Intel’s and Nokia’s investments are symptomatic of the software industry’s growing interest in automotive. Castrol’s and Volvo’s investment could be seen as industry incumbents venturing to stay ahead of the game and maintain leadership positions. Denso and Magna are both tier 1 suppliers to whom the current OEMs and newcomers will look to assemble and deliver the pieces of the autonomous vehicle jigsaw. Peloton looks like a very interesting piece of the jigsaw. UPS has a big stake in the future of industrial transportation and logistics. Amidst all the hoo-ha in the passenger vehicle market, with the big brands (and newbies) outbidding each other with promises to introduce the first fully autonomous passenger vehicle, Peloton may provide two useful lessons: there are investment opportunities in technologies for the semi-autonomous vehicle, and it’s industrial transportation, rather than passenger transportation, which will lead the way towards more autonomy and eventually full autonomy. Filling holes on the road to autonomous vehicles – what are non-automotive corporate VCs up to? This is an excerpt from ‘Venturing and the Future of Mobility and Automotive Technology’, a new report from Global Corporate Venturing and LEIF, which is sponsored by Denso International America, Castrol innoVentures and Magna.The report will be released in November ahead of a conference of the same title in London on December 1st, where Magna and Castrol innoVentures will among the speakers. For more information on the report and/or the conference(s), please contact tom.whitehouse@london-eif.com. 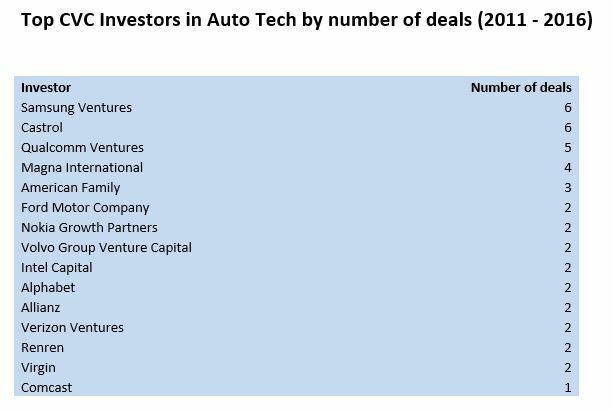 One of the most exciting developments in the automotive industry today is the increasing investment activity of corporate VCs from outside the traditional automotive industry. They bring a fresh perspective, one that is perhaps more open to disruptive technologies and business models. They also bring different skill sets, while increasing the overall pool of available capital, enabling faster development of more start-ups than was hitherto possible, particularly given the dearth of exits in the auto-tech until quite recently. Right now the whole transportation value chain is up for grabs. I can’t say whether our transportation needs in five years will be met by a company today seen as software giant or whether the incumbent OEMs will hold on. Neither can the incumbent OEMs or software giants, which is why they’re all busy venturing to survive and prosper. And they might both be muscled off the road by newcomers. Who knows? In the summer, the Finnish capital of Helsinki has a tram converted to a fully functioning mobile bar. This meets both the transport and refreshment needs of its passengers. I look forward to the day when bars and cafés will be synonymous with autonomous vehicles. What could be better than commuting in a safe mobile bar which serves your favourite coffee on the way to work and then your favourite wine or beer on the way home (not every evening of course, just Fridays). Nokia Growth Partners’ 2016 investment in the $275m series E round of Deliveroo, the online food delivery platform, give us a sense of how close my personal transportation hopes may be to reality. Commenting on NGP’s investment in Deliveroo, Paul Asel, its managing partner, says: “Last-mile delivery is an area that comes from the enhanced intelligence stemming from the convergence of cloud, mobile and sensors technologies.” The same factors are at play in the last mile delivery of the human. So maybe Deliveroo or its competitors will soon compete with Uber and its competitors? After all, Uber has already diversified into food delivery. 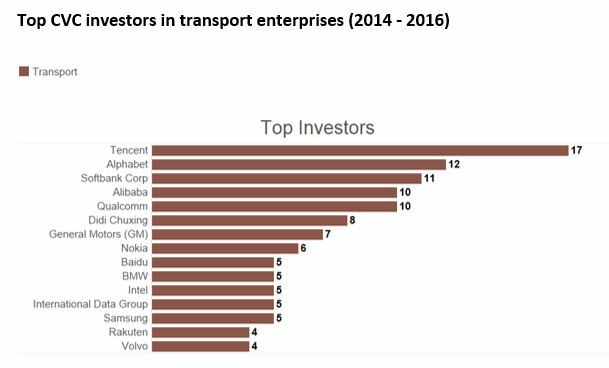 Visibility into driving behaviour is a key interest for Qualcomm Ventures, another corporate VC not typically associated with transportation, but which like Nokia, is very active. Qualcomm Ventures was an early investor in Cruise Automation, the autonomous vehicle business acquired by GM for $1bn in March 2016, probably the most impressive exit in this space so far. What automotive venture opportunities does Qualcomm Ventures seek? So the question is who has the steroids and are they legal? According to Jain, Cruise Automation was backed by Qualcomm Ventures precisely because it had demonstrated advanced capabilities in “hyper-congested city traffic where these vehicles are finally supposed to operate and not just in closed parking lots.”, What’s more, Jain deemed the company highly relevant even without a major legal overhaul in the regulations governing autonomous vehicles. “[Cruise is] of tremendous value even if the regulatory framework doesn’t evolve as quickly as we hope,” he adds. Andrew Haughian, partner at Pangaea Ventures, the Vancouver-based multi-corporate VC specialising in advanced materials, is also looking for all-weather autonomous vehicle technologies. Many of the major OEMs have set themselves deadlines for their commercial introduction of fully autonomous passenger vehicles; Tesla by 2018, Toyota by 2020, BMW by 2021 (in China), Nissan by 2020, Ford by 2021, Baidu by 2018, Honda by 2020. (These goals are also no doubt subject to regulatory progress in respective markets). But if we look at industrial transportation, the timelines are much shorter. In fact, autonomous vehicles already here. “Many people may not know this, but Caterpillar is a leader in the autonomous vehicle space,” says Brian Lowry, Investment Manager at Caterpillar Ventures. “Automotive companies get a lot of press for autonomy development, but we have fully autonomous mining trucks running in production in mines right now,” he adds. TriLumina and Clearpath Robotics are both recent investments from Caterpillar Ventures. TriLumina is a LiDAR technology company focused on the autonomous vehicle space. Clearpath is a Canada-based manufacturer of unmanned vehicles for industrial research and development applications. “Caterpillar is continuing to develop in this space to create semi and fully-autonomous machine systems that will lead to greater efficiency and improved safety for our customers and their operators,” says Lowry. Who are the Top Corporate VCs in Autonomous Vehicles? This is an excerpt from ‘Venturing and the Future of Mobility and Automotive Technology’, a new report from Global Corporate Venturing and LEIF, which is sponsored by Denso International America, Castrol innoVentures and Magna. The report will be released in November ahead of a conference of the same title in London on December 1st, where Magna and Castrol innoVentures will among the speakers. For more information on the report and/or the conference(s), please contact tom.whitehouse@london-eif.com. Rarely in the long history of the automotive industry has it been as open and vulnerable to change as it is today. Car sharing, ride-hailing, electrification, connectivity and the rapid emergence of autonomous vehicles in passenger and industrial transportation are potentially as disruptive as the switch from horse and cart to the car and the railways. Trains, planes and automobiles will never be the same again. The 20 corporations listed below (boxes 1 and 2) are using venture capital to try to ensure they are on the right side of the forces of creative destruction unleashed in today’s automotive industry. There’s a lot at stake. The costs of missing out on a revolution in transportation will be very high. The prize for the winners will be dominance of a trillion dollar industry. It’s no surprise to see Ford, Castrol, Magna and Volvo on this list. They are incumbents with a track record in innovation they need to protect and sustain. But the presence of companies more renowned for their internet and digital expertise such as Intel, Qualcomm, Comcast and Verizon, confirms that transportation is a huge new territory ripe for connectivity, whose future will be determined as much by software innovation as hardware. Allianz might seem an ‘unusual suspect’, but transport connectivity creates new challenges and opportunities for the insurance industry and Allianz is not the only insurance company actively venturing. If we narrow our search and look at the lead corporate VCs over only the last two years (box 3), we see more Asian internet and software giants entering the fray. Tencent takes top spot (by number of deals), with Softbank and Alibaba, Didi Chuxing and Baidu not far behind. It’s in Asia, China and India in particular, with relatively under-served markets for transportation (both consumer and industrial) that are likely to go straight to shared, connected and autonomous or semi-autonomous vehicles. These markets are less encumbered by what will soon be seen as the ‘legacy’ model of owner-based, unconnected, driver-dependent transportation. 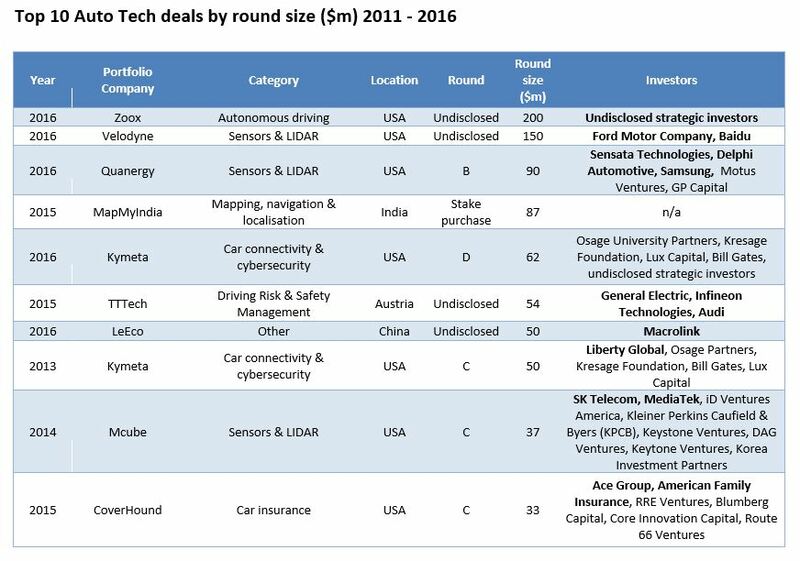 Looking at the top ten auto-tech deals by round size since 2011 (see box 1), we see firstly that corporate VCs are involved in nearly all of them, secondly, the biggest deals have been done in the last two years (confirming that interest is growing) and thirdly that autonomy and connectivity are the strongest themes. Lidar is a type of sensor that helps the autonomous or semi-autonomous vehicle see the outer world (and hopefully not bump into things). In August, Ford and Baidu jointly invested $150m in Velodyne, a US-based producer of Lidar 3D mapping technology. Velodyne has specialised in developing Lidar sensor technology for self-driving cars and 3D mapping since the mid-2000s. A week later Samsung, Delphi Automotive and Sensata Technologies’ announced a joint $90m investment in Volodyne competitor Quanergy, which is also US-based. Audi said its 2015 investment in TTTech, an Austrian company specialising in real time safety control technology, was prompted by TTTech’s ability to help them make the move to autonomous and semi-autonomous driving. Audi’s co-investors were GE and Infineon. There’s lots of excitement about autonomous and connected vehicles and increased venturing. Are we therefore approaching hype territory? Probably yes. Research firm Gartner last month warned that autonomous vehicles generally were just past the “peak of inflated expectations” and about to slip into the “trough of disillusionment” before reaching mainstream adoption in about a decade. Very few corporate VCs are telling their parent companies they have to hold their investments for a decade. So disappointment may be just round the corner for some, if not most, of today’s investors. But this, of course, is just the nature of venture capital. Some investments go massive. Some do ok. Others die. Right now, what’s buoying venture appetite are some good exits (see box 5) in which some corporate VCs have already enjoyed returns. There’s nothing like a few headline-grabbing exits to get the venture juices flowing.